Garlic and herb baguette. Serves 4 Blend together 120g salted butter, 5 gloves grated garlic and 1TBsp each finely chopped chives, parsley and tarragon. Slice a part baked baguette into 1cm diagonal slices, leaving them attached at the base. Spread the butter generously between the slices and any remaining over the top of the baguette. Bake, wrapped in foil, in a pre-heated oven at 180oC for 20-25 minutes until golden brown and crisp. Serving Suggestion: Wash before use. Snip and sprinkle into soup. 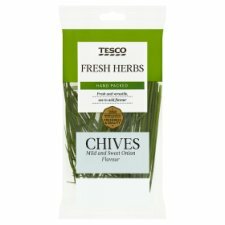 Add chopped chives into mash or sprinkle over boiled potatoes. Simply add to scrambled eggs and omelettes before cooking.